This guide is not intended to be guidelines on judging koi for competitions, just a basic guide on selecting a good koi/goldfish at your local fish shop. When selecting koi, a little bit of thought must go into the process. You want to introduce new fish that will complement the ones you already have or the ones you plan to get in the future. All ponds will have a maximum number of fishes suitable, based on the size of the pond. We normally recommend up to 6 koi per 1000 litres, keeping in mind that koi grow BIG! So if you can only have 10 fish in your pond, you might want to consider getting a range of different colours and varieties. It is also better to choose fish of similar size so that the smaller fish don’t get bullied during feeding time! Now you know how many fish you want, and what size, here are a few things to look out for when selecting some new guys for your pond. Fish Health is the most important factor to consider when choosing your koi. You want a koi that is robust and active, that has all its fins intact. You don’t want any fish that shows signs of disease such as small white spots, sores or any fish that have ratty fins or tail. The fish should use its pectoral fins a lot, rather than having them clamped to the sides of the body, and the fish should swim confidently with strength, rather than listlessly. Koi, like animals, should ideally be symmetrical. The fishes gills should not poke out and should conform smoothly to the shape of the body. The fish’s mouth should not hook down, and there shouldn’t be and redness in the gill area. The fish will also probably put up a bit of a fight when being caught, rather than just lounging back in the net when scooped up! This is where is gets subjective. If you are after more traditional types of koi, as many of you are, then there are many different strains to suit your tastes. 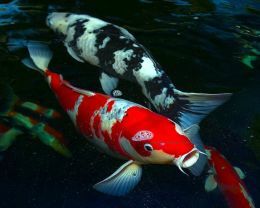 Most of the Championship koi in Japan are red + white (Kohaku) (like the Japanese flag!) or red + black + white. In these fish, we look for vibrant whites, deep reds with distinct blotches, absolutely black blacks. The best fish often have a white nose, to define the face and are of course healthy! Deep reds are often hard to come by.. Even if you bred two champion koi together, many of the young will only have orange colouration, which is just the luck of the draw. And it can sometimes take a couple of years for the orange to flare up into a deep red hue, and the patterns that are shown on the fish are completely random! This is why championship koi are quite rare, as they are a combination of good breeding, years of growth and lots of luck. Hence the price difference. This is not to say that you can’t be lucky! When choosing your koi at The Fish Works, you can rest assured that we keep all of our fish healthy, and only have quality gene stocks. That little koi you buy may just turn into a champ!